I got this specimen as Pericosmus macronesius, but I don´t know, if the taxon is correct. 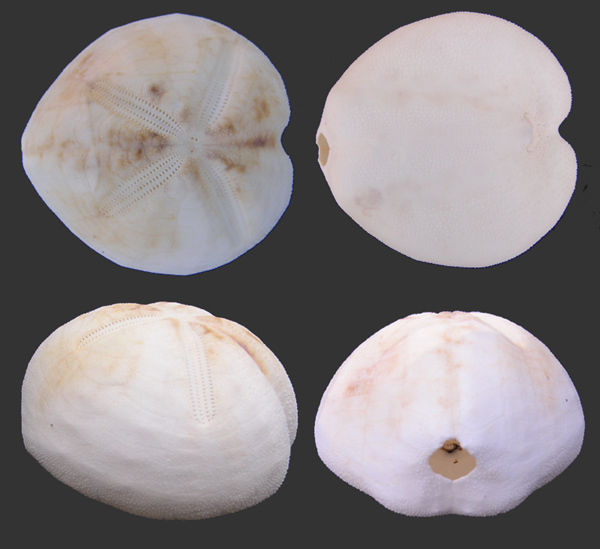 With concern to the outer shape the specimen is similar to the Pericosmus macronesius shown in Heinke Schultz, Sea urchins, Figs. 841 and 842, pages 451/452, but a denuded test is there visible only as side view. The peripetalous fasciole of my specimen, although not so clearly visible, seems to have only an angle and not a deep indentation in the interambulacra (see upper part of the left upper picture).